Ford is all about powerful performance. But that doesn’t mean that Ford cars don’t need repair services and regular maintenance. Such services can make a Ford car more durable. Keep and boost your Ford’s performance through quality fixes and routine maintenance services at our auto shop in Towson, Maryland. Hollenshade’s Auto Services has been serving car owners in the area since 1939 — it’s time we take care of your Ford, too. 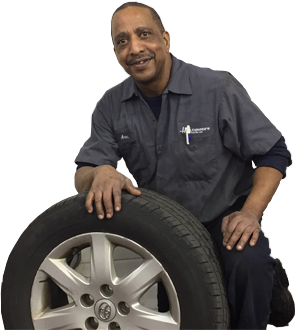 Our auto shop has a team of technicians who specialize in Ford vehicles. We do a battery load test and start replacement to make sure you don’t get stranded with a car that won’t start when you need it. Our team also handles battery corrosion, battery drain, and other charging and starting issues. Never ignore that squeaking belt noise on your Ford. Let our Ford specialists inspect your car’s belts and hoses for wear, damage, missing ribs, or debris buildup. Delivering accurate diagnosis and quality workmanship, our auto shop in Towson, MD will help you get back on the road with a car that’s equipped with new, efficient belts and hoses. Is it time to renew your vehicle registration? Bring your Ford to our shop for emission diagnostics. We’ll help you find out not just whether your car can pass the DMV emission test but also address any issue on your EGR, PCV, or EVAP system. And even if it isn’t renewal time yet, it’s best to head to our shop to make sure your car’s emission control systems are all running optimally. With Hollenshade’s Auto Service, there’s no more guesswork. Our Ford technicians can accurately and efficiently diagnose the electrical problem with your car. Plus, we provide the best value by fixing the issue the first time and using OEM replacement parts. Unlike in other auto shops, you don’t have to come back to our Towson shop multiple times to have the same thing repaired. For Ford repair and maintenance in Towson, there’s no need to go out of town. Call us today.